RealityShifters | Welcome to the Quantum Age! It is my great honor and pleasure to officially welcome you to the new Quantum Age! Just a few decades out of the Information Age, the arrival of the first quantum computer and numerous scientifically verified macroscopic scale quantum phenomena heralds a brand new age for humanity. Just as the transition from the Industrial Age to the Information Age changed not only our technology, but also our way of thinking and way of life, so too is the Quantum Age radically changing how we view ourselves in relation to the world. 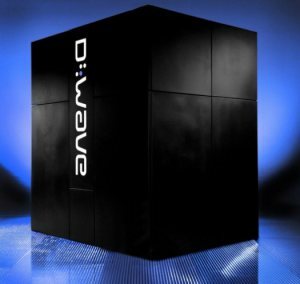 When the first-ever quantum computer, the Canadian-made D-Wave Two, fires up and goes live this month, mankind officially takes our first steps out of classical computing and its world of binary bits and bytes, and into the probabilistic multiverse of qubits--that can be both "0" and "1" at the same time in a marvelous superposition of states. When you first see the rather plain black boxy D-Wave Two, you would probably not suspect that tens of millions of dollars were spent developing it with dozens of scientists over the past decade... or that Google and NASA just spent millions of dollars buying the first one off the assembly line. Much like the ENIAC computer that was one of the most popularized early computers of the Information Age, the D-Wave Two is an early front-runner quantum computer that stands for a generation of new things to come--not the least of which is a whole new way of "thinking like a computer." 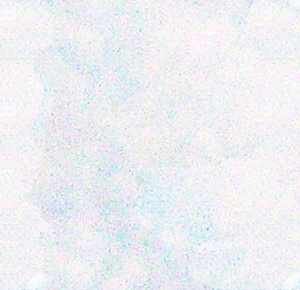 Whereas current Classical Information Age computers comprehend a world of binary opposites such as True and False, Quantum Age computers cogitate in a fuzzy-logic, intuitive fashion that is comfortable contemplating probabilities amidst complex systems of entangled, interdependent variables. In short, Quantum Age computers invite us to widen, broaden, and deepen what our highest standards of rationality are, to expand into the gray areas between black and white. School children of the future will look back at 2013 as the beginning of seeing the multiverse in a whole new way, according to such quantum mechanics principles as: superposition of states (eg: being both True AND False), entanglement (eg: considering intrinsic interdependencies), and teleportation (eg: information instantly being known some distance away). The arrival of quantum computers invites us to move beyond an either/or, black-versus-white binary view of rationality to incorporate the concepts of quantum behavior into daily life. Thanks to a newfound dependence on quantum computations, we will be able to see how our feelings of intuition are a natural part of quantum biological processes at work in our bodies that provide us with information about people, places, activities and things we are entangled with... as well as the best possible choices to make when on some level we are aware of existing in a superposition of a wide variety of possibilities. What's most amazing to me isn't so much that computers will be doing so many amazing computations as how radically our concept of "rational thinking" is about to change. The seemingly simple transition from bits to qubits takes us from our westernized view of True/False logic into a wild and woolly realm of True/True-and-False/Not-True-Not-False/False. It's a weird, wacky wonderful world of probabilities, and recognizing that just because we think something is one way, doesn't mean it actually will stay that way, or that others will even necessarily see it that way. Thanks to quantum computers and quantum biology and quantum astronomy, we're about to see that everything in this multiverse exists in many possibilities. Our consciousness allows us to travel from one possible world to another. Our legal system will need to operate differently in order to accommodate a more probabilistic way of thinking--so that sometimes one person truly experienced a different reality than another. Historians, psychologists, sociologists, anthropologists and biologists will come to recognize alternate histories as being a natural part of existence, and this will have huge implications for the way we view personal, political, social and natural histories. Medical professionals will understand that spontaneous remission is a process that naturally occurs, and will encourage people to adopt the most helpful states of mind for attaining and sustaining optimal health. In short, the biggest changes as we fully enter the Quantum Age will be in the way we view ourselves and the world, much more than what our technology (including actual quantum computers) is doing for us. I wrote a recent blog post, Welcome to the Quantum Age that provides additional information about the first quantum computer, and this amazing step forward we are taking this month into a whole new Quantum Age. The key to shifting reality lies in attaining the right state of mind. Sign up for this (Free!) teleclass to learn to shift from one reality to another as easily as shifting gears on a car. Transform your sabotaging beliefs into personalized affirmations, and experience a state of relaxed, energized, mindful awareness with an Ocean Wave Breathing Meditation so you can step into a healthier, happier life. Register in advance for this internet teleclass that is listed in the Personal Development section at Global Teleclass. 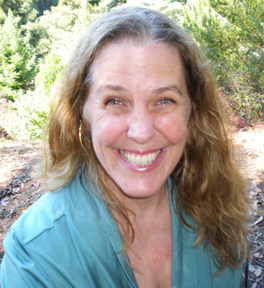 Tom Kappenman and Ramon Almonte interview Cynthia, discussing shared interests in meditation, synchronicity, intuition, consciousness, reality shifts, strange phenomena, energy fields, and more. Tune in to experience the very special alchemy that happens when Tom, Ramon and Cynthia discuss fascinating topics from three key geographic points along the Pacific Rim. While it's true that we just left the Industrial Age behind a few short decades ago for the Information Age, the times are again changing and we are already at the dawn of the Quantum Age. Find out why schoolchildren of future generations will look back at 2013 as being the start of a whole new way of thinking and living... and how we can benefit from a Quantum Age state of mind right here, right now. When you take a look at the toolshed-sized black box that is the D-Wave Two (also known as the first quantum computer in the world), you would probably never guess that this innocuous-looking piece of technology cost tens of millions of dollars to build, and sold to the first customers--Google and NASA--for $17 million dollars. Much like the ENIAC computer before it, this early front-runner represents a generation of new things to come, not the least of which is a whole new way of "thinking like a computer." Whereas current Classical Information Age computers comprehend a world of binary opposites such as True and False, Quantum Age computers cogitate much more intuitively, with a keen grasp of probabilities and the way variables interact with one another in a natural, entangled fashion. 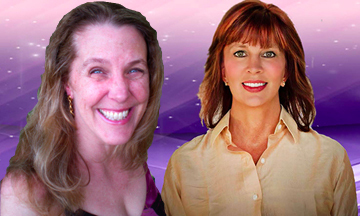 Tune in for a marvelously wonderful discussion with me and Christine Andrew of Enlightening Radio about what happens when reality shifts. How do you know what is really real? What is the true nature of consciousness and reality? Re-examine your beliefs and assumptions about the nature of reality in this interview. Expand your understanding of what reality is, and how consciousness plays a role in our experience of reality in this fascinating conversation guaranteed to stretch the limits of your imagination. Hi! I just found your website, and realize I am not alone in this experience of shifting dimensions. 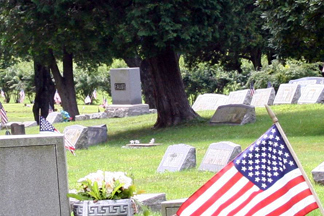 For some time I have been taking pictures at a local cemetery. A month or so ago, when reviewing my pictures, I noticed that some distinctive stones were showing up in more than one place. It took me a while, and many, many photos to realize that most of the scenes were not recognizable. This was only noticeable to me when I viewed the pictures. I know where each one was taken, but the photos do not match what I see. I have almost concluded that there is a different me that takes the picture and one who views it, and random in the order. When the pictures or the actual scene look "normal" then it is the same "me" taking and viewing. I know the cemetery very well, having taken hundreds, if not thousands of pictures. I have chosen an area with a "focus" stone to share with you, and these are just a small example (a cropped out area) of one of many shifts this stone takes part in. I know there are probably unlimited possibilities to this shifting, may be different EVERY time it happens. I have discovered this quite by accident when closely examining my photos for anomalies. 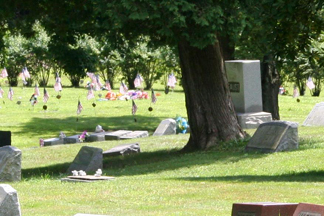 It is difficult to pin down where each picture is taken, except that I know where I was on the roads through the cemetery. I drive through and stay in the car. Sometimes I have a friend with me taking pictures, but she doesn't know the area so no picture looks different to her. I am making files of stones appearing in various places--which is a big task with so many pictures. Sometimes there is a car on a road that "isn't there" (in the picture). 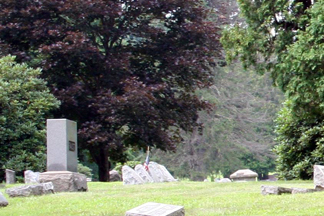 Understand that when I am physically looking at the cemetery, it looks normal, the same as always, more or less. When I look at the pictures, I don't always recognize the area. In fact, hardly ever. But, I know where it was taken or approximately anyway. At first I thought there were two possible versions, but now think they may be unlimited. I always take two of each scene and so far have not caught the "switch" in between the two pictures. The other interesting perspective is where I caught a white house in a picture. There is no house there and I had never seen it with my eyes. As time went on, I realized it was a large mausoleum that is "normally" two fields and two roadways away from that location. I have many pictures of that, and lately have been seeing it with my eyes. I will send a couple of these also. 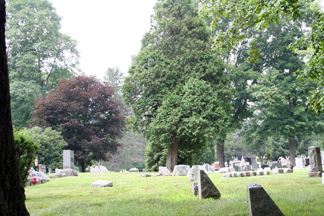 Keep in mind that behind the "focus stone" and the red tree, there is nothing but a flat field of gravestones. (Sometimes : ) I did take the video camera with me last week, but am careful to not attract attention, so didn't prove much. Too much activity. Will try again. Thanks for the informative website. 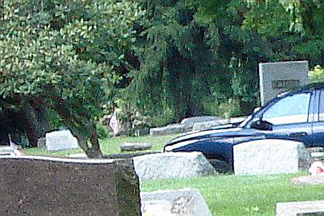 Note from Cynthia: I am simply amazed at the way that very distinctive headstone is showing up in very different places in the cemetery. An ever-growing number of physicists are stating that everything exists in a superposition of states--not just quantum particles--and it makes sense that someone wishing to observe shifts in reality could hardly find a better place to watch this natural phenomenon than a cemetery. I had my first Reality Shift!! =-) Hey Cynthia, I am excited to report about three weeks into reading your Reality Shifts book, I experienced my first one! I have a 2006 Dodge Charger. Since the day I bought my car, the passenger seat seatbelt has been permanently twisted. I wrestled with it trying in vain to untwist it within the slot of the buckle. I even took it to the dealership, and they told me it was likely a factory defect, and that fixing it would be more trouble that it would be worth. So even thought it's bothered me, I just accepted the fact my passenger seat seatbelt had a permanent twist in it over the lap of whoever sat in my passenger seat. Tonight when I got in my car, I had some groceries I'd put in my passenger seat and I always buckle the seatbelt around them to keep them from flying all over if I stop or turn, and to my amazement the twist is gone! =-D I'm the only one who is ever in my car; I am single. It's as if by magic (or a Reality Shift!) the seatbelt has righted itself! Thought you'd like that! Note from Cynthia: What a difference it makes when an ongoing minor nuisance is corrected so unexpectedly--I love this reality shift! This is such an excellent example of a reality shift, in the sense that you now have a situation you truly appreciate (an untwisted passenger seatbelt) without having had to spend time and money getting it corrected. I love the way this happened after you started thinking about reality shifts while reading "Reality Shifts," too! It's also been my experience that the more I think about reality shifts, the more frequently I observe them. Hello. I just found your realityshifters website last month and love love love what I've read so far. I thought I'd share a strange day I experienced last year when time shifted twice, in two different directions. I had just finished making the bed and tidying up the bedroom when I checked the alarm clock on the night stand to see what time it was. I was thrown off a bit at first because it seemed like it should have been later than the clock said it was. Having gone through the same morning routine for months, I found it odd to be so ahead of my typical schedule but quickly dismissed it. A short time later after I'd picked up the bathroom, I walked into the living room and saw the time on the DVR. What?!? It didn't take me an hour to pick up a few towels and clean the counter off. What gives? I checked the weather channel on TV, which usually shows the local time somewhere on the screen, and it matched the time showing on the DVR. So my alarm clock is off, I figured, and walked down the hall to fix it. But how could it be an hour early? I know it was set to the correct time the day before, because I had an appointment, and it was the only clock I used while getting ready to leave. And I made my appointment on time, so... I don't get it. I could understand if I somehow tapped the wrong button in my sleep, but that would have changed the time to an hour later, not an hour earlier. I would have had to accidentally hit the wrong button eleven times to set the time an hour earlier than it should have been. That's quite unlikely. It's possible... but I don't think so. I thought it was odd, and told my husband... but again forgot about it soon after. Later that evening, I went on a walk with my neighbor like we often do, and we left around the same time as always. About half way through our walk, my neighbor checks her cell phone for the time, and is shocked that it's an hour later than she'd thought. We walked the same route and left at roughly the same time, so there shouldn't have been an hour difference in the time. We kept walking, and as we neared our homes, I noticed that the fast food restaurant on the corner was still open for business--which they shouldn't be at that time of night. They should have closed a while ago, I thought... but I figured maybe they'd changed their hours or something. But as we walked into my kitchen to have a glass of water before saying good night, we both noticed the clock on the wall was an hour earlier than we'd thought. It was an hour earlier than my neighbors cell phone was showing just a few minutes before when we last checked it! The next morning, the phone was displaying the correct time, and the alarm clock was, too. I have no idea what that was about--why time went backward and then forward. Cell phones can change the time on their own as it moves across time zones but my alarm clock needs human input plus we hadn't walked across any time zones either. lol Anyway, I thought I'd share my experience. It was trippy and kinda cool. I just hope I wasn't supposed to do anything spectacular in those two strange hours because I didn't. Maybe I'll tell you about my magic recycle/trash bin sometime. Or the eagle sitting atop a headstone at the cemetery or Reginald the bold little bird that visited me on four separate occasions...I waited a long time to encounter something amazing and now something amazing is going on nearly everywhere I look. Hope you're doing well and might I also say what a wonderful smile you have. My goodness, I can't help but smile whenever your picture scrolls across my computer monitor. We need more smiles that genuine in the world. I think I'll add mine right now. Thank you and take care.. 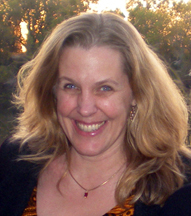 Note from Cynthia: Thank you so very much for sharing your time shift experiences. Having just one time shift like the kind you describe is noteworthy, but two in one day is remarkable! The time shift with your friend is especially interesting, since two of you both experienced a time shift together--so the shift can't merely be chalked up to having lost track of time or confusion. An aspect of your experience I find especially fascinating with your two time shifts in one day is that it's almost like you wondered in the morning, "Where'd that missing hour go?!" and then later that same day, it was returned to you! With regard to why these shifts happen, as I write in my book, Reality Shifts, I suspect it's simply "be cause." It's a reminder that we are causal agents... that our true identity is consciousness, rather than any particular physical version of ourselves in this amazing multiverse we call home. I'd love to hear more of your reality shift experiences! (Discover Alternate Histories & Parallel Worlds was a fascinating issue of RealityShifters I, too, thought Louie Anderson had died. Wow... freaked me out to find he's alive! Also, I want to share, briefly, that I have had a fascinating experience. Years ago, (30+) I worked for a small printing place. Whenever I walked up the street to grab lunch for us, I would pass by a beautiful old fashioned apartment building.. I was so drawn to its architecture, etc. Well, guess where I live today? Not only do I live in the very same apartment building I felt so strongly/strangely drawn to, I overlook the old print show that is now closed! Since I moved here over four years ago, I have been having strange, compelling dreams, which I am beginning to suspect are alternate lines of history connected to that shop... anyway, fascinating stuff, and I wanted to share. I must also admit that the book Dreamgates by Robert Moss really got my attention to dreams as gateways in the first place. Note from Cynthia: Thanks so much for your lovely email! While I don't recall Louie Anderson having died, I've recalled so many others, and I've been shocked each and every time to see people alive after having seen big media fusses made across multiple media channels (TV, newspaper, magazines, internet). What an amazing experience that you felt so drawn to beautiful old-fashioned apartment building decades ago, and now you live there, overlooking the place where you used to work! What makes this so interesting is sensing connections through dreams related to that shop. In dreams, we can be pure consciousness, from which all realities may be seen and accessed. I have a question. The other day I had to pick up my son at his work. When we got home he thanked me for the change (money) he says I had just given him. I had no change at all. I told him there was no way I had given him money when he got in the car. It still baffles me. Could this be one of those reality shifts? Yes, this kind of different view of what just happened sounds like a reality shift. We sometimes experience different realities from those around us, unbeknownst to us. The only way we find out is by discussing what just happened, and the topic doesn't always come up, so goodness knows what kind of differences we're experiencing all the time from one another! Fortunately, when one of us tells another what just happened (such as your son thanking you for the change you'd just given him), you are alerted to the fact you've both lived through different realities, parallel worlds. I describe a couple of similar conversations in which I lived through different realities than my husband and daughter in my book, Reality Shifts: When Consciousness Changes the Physical World. I have had experiences where family members will ask me about a certain thing that happened years ago and I have no memory of it. My memory is good so it's not that, it just seems that I have experienced a different reality somewhere along the way. If it happened only once I would say it was a coincidence but it has happened a number of times now. I hadn't thought of it as being parallel realities but it sure fits. Sometimes it happens the other way around as well. I’ve recalled things I know for sure happened, and when I asked people about it (following up on a promise I heard them make to someone else), I’m met with baffled, confused faces and a situation where I am the only one who remembers that entire scenario. This happened with memories I have of when my parents purchased carved wooden furniture from wood-workers in India. The furniture was shipped back home, and would need to be assembled and fitted with glass table tops… and I remembered my parents promising to take photos of the finished furniture in place with the glass tops, and send pictures back to the woodcarvers. Many months later when the furniture arrived, was assembled, was repaired where some shipping damage had occurred, and was fitted with the glass table tops, I asked my parents, “Have you taken the pictures of the furniture yet?” This is the point where my parents just looked at me with blank faces… and it seemed so strange to me they could have completely forgotten such a memorable conversation. It hadn’t meant a lot to me, and I wouldn’t have thought to take the pictures (I was just a child at the time), but I knew my parents kept their promises and usually had really good memories, so the whole incident seemed quite bizarre. Tibet Through the Red Box is one of the best illustrated books I've ever read. Much more than a children's book, this tale tells the intimate story of a young Czech man sharing excerpts from his father's diary. The father was invited by the Chinese to film the construction of a highway in the highest, most remote mountain ranges in the world, and while filming this project, was separated from his group. What happens next is the stuff of magic and legends... yet all purportedly true. A letter from home was delivered to the lost documentary filmmaker by a little Tibetan boy wearing red rags and jingle bells... in the middle of nowhere. Fish with human-looking faces swam in crystal clear waters of a deep lake. A gentle giant Yeti nursed the filmmaker back to health with honey herbal tea in a cave above a hidden valley paradise. And the amazing Lhasa Tibetan home of the Dalai Lama was filled with wonders and delights far beyond any words. I love the structure, rhythm, and pacing of this story, as it brings the reader slowly into the enchanted world of Tibet of the 1940s. There is such grace in the story-telling, starting with the author's memories of the tales his father often told of travels in Tibet. I loved hearing how the author as a young boy was confined to bed rest, but when his father returned from Tibet, every place the father placed his hand on his son began to heal. The author was thus able to sit up, stand, and walk almost immediately upon his father's return home after so many long months overseas. The pictures in this book tell the story nearly as well as the words. Highly recommended!